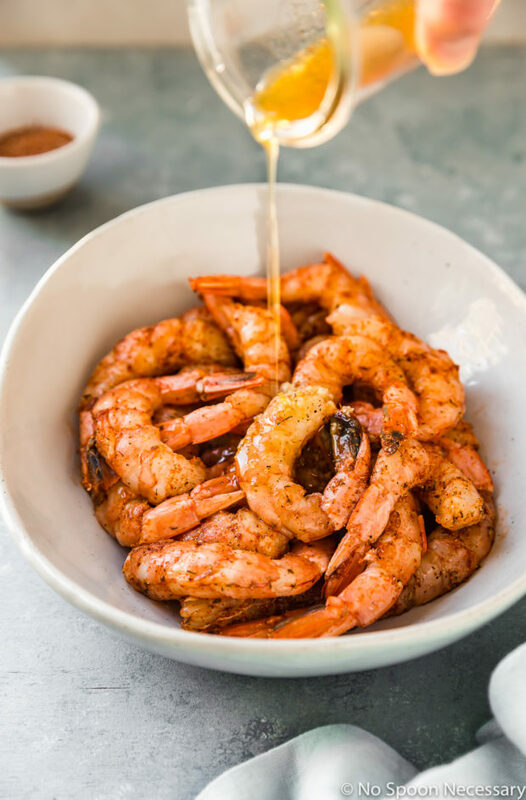 These Easy Cajun Honey Butter Shrimp are made in one skillet and ready in 20 minutes or less! 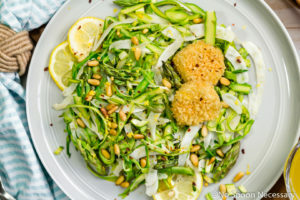 It’s an incredibly easy, yet flavorful meal that the whole family will love! Plus, the silky honey butter sauce is to die for delicious!! Today we are going to keep things nice and simple. But don’t worry, we are still keeping thingscrazy delicious! So, why am I invoking my right to K.I.S.S. (Keep It Simple Stupid)? Because, with Halloween less than 5 weeks away and the holiday craze quickly approaching, I need all the simple I can get. Plump and succulent cajun seasoned shrimp coated and glistening in a silky, buttery, smoky and spicy sauce with a hint of citrus. 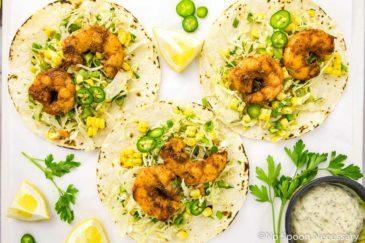 Garnished with a sprinkling of herbaceous parsley and scattered with fresh sliced scallions, these shrimp are seriously stellar! 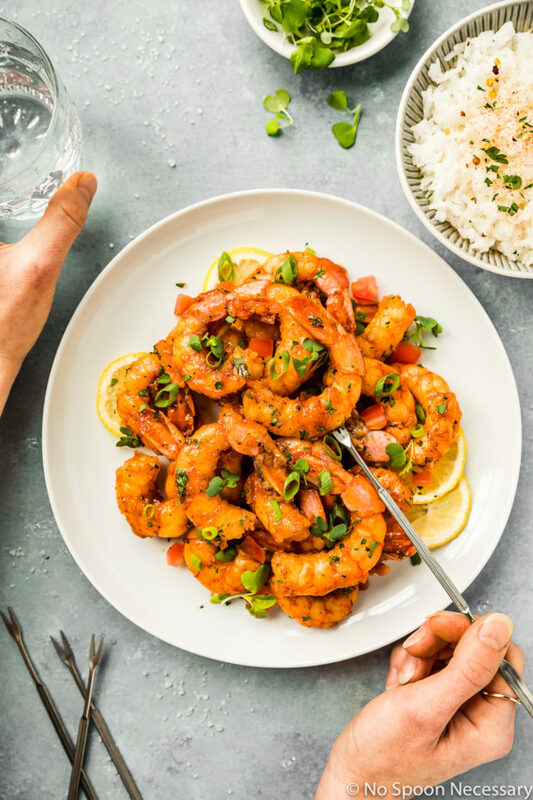 Fragrant, flavorful and filling, these honey butter shrimp can be served with a carbohydrate and vegetable for a main meal, or served on their own as an addictive appetizer! While these saucy shrimp are totally delicious, they are also crazy easy to prepare! I am talking 20 minutes and one skillet type of easy here. Basically, this is what easy weeknight dinner dreams are made of right here. How do you cook cajun shrimp on the stove? First, whisk together the sauce. Add the garlic, lemon juice and lemon zest, then set the sauce aside. In a large bowl, add peeled shrimp and toss with cajun seasoning. Drizzle on half of the sauce and stir to coat. Set aside in the refrigerator to marinate. Melt two tablespoons of butter in a large-sized skillet over medium-high heat. Add the shrimp and season with salt and pepper. Cook, stirring frequently, until shrimp are just starting to turn pink. Add in the remaining sauce mixture and 2 more tablespoons of butter to the skillet. Continue to cook until the shrimp is opaque and the butter coats the shrimp. 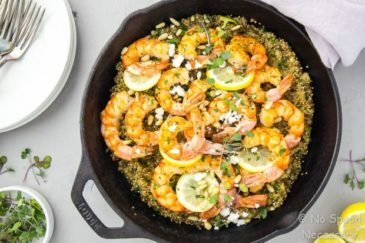 What to serve with Cajun shrimp? There are a ton of side options for Cajun shrimp! While we served our Cajun butter shrimp with white rice, don’t feel that is your only option! 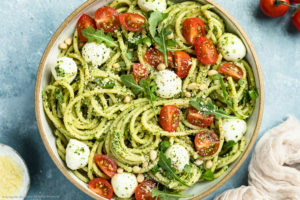 Pasta – penne, linguine, shells, etc. Beans – red beans would be more traditional, but use whatever you like! Vegetables – roasted peppers, broccoli, corn on the cob, collard greens or green beans pair nicely! Crusty bread – you will want plenty of bread for dipping into the honey butter sauce! Cajun seasoning is a blend of salt with a variety of dried spices, most commonly including cayenne pepper, paprika and garlic. 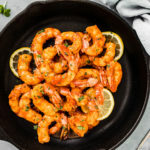 The homemade Cajun seasoning recipe for this butter shrimp is made up of salt, cayenne, paprika and garlic as well as onion powder, dried thyme, dried oregano and freshly ground black pepper. Cajun shrimp is mildly spicy. 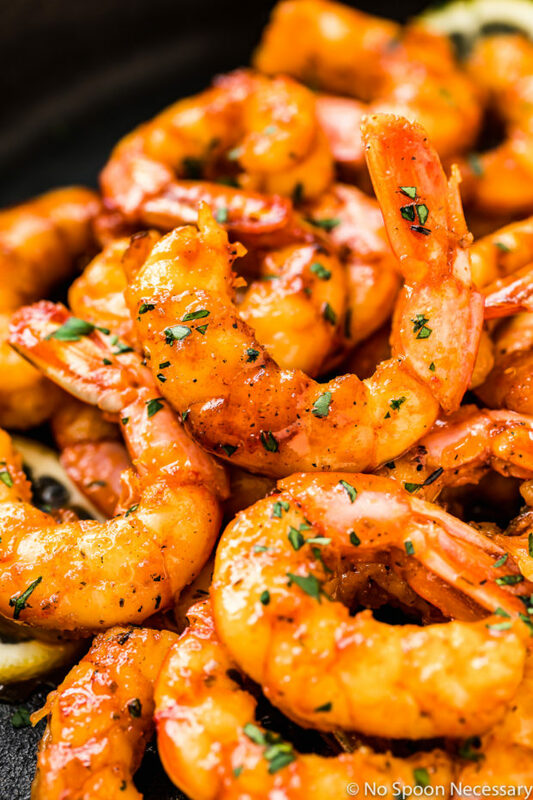 The main heat source for cajun butter shrimp is cayenne pepper. 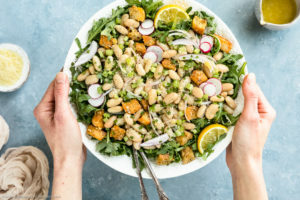 However, there is less cayenne pepper in Cajun seasoning compared to the other spice ingredients, therefore cajun seasoning (either homemade or store bought) is normally quite mild. If you like your cajun shrimp more or less spicy, simply adjust the amount the of cayenne in the cajun seasoning accordingly. While I used large shrimp for this cajun butter shrimp recipe, you can use any size shrimp you would like, just be sure to adjust the cook time up or down accordingly. I left the tails on the shrimp for aesthetic purposes only. Feel free to remove the tails or leave them intact. You can purchase Cajun spice mix at the store, or you can make your own. I highly suggest you make your own so you can control what is in the spice blend and adjust it to your own tastes. Besides, you probably already have all the seasonings needed in your pantry, and making your own is cheaper than buying a prepared one. The recipe for homemade cajun spice blend is in the notes section of the recipe below. 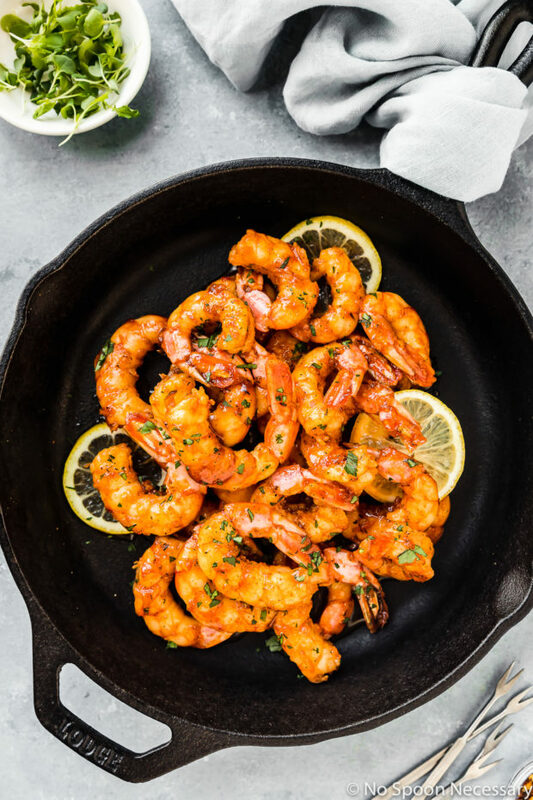 Ready in 20 minutes and made in just one skillet, these Easy Cajun Honey Butter Shrimp belong on your table! 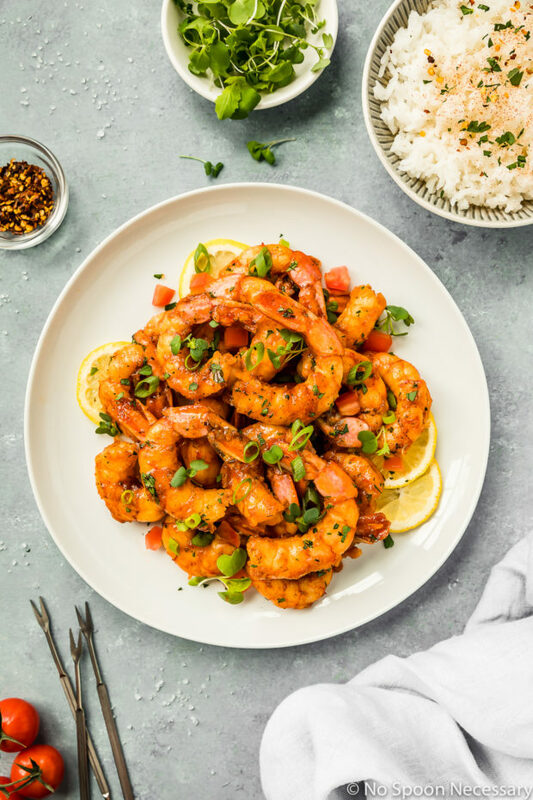 Whether you serve them as an appetizer, or as your main dinner dish, these shrimp are definitely going to be a hit! Until next week, friends, cheers – to succulent shrimp! 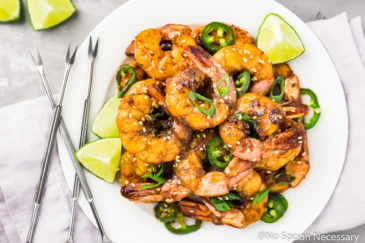 These Easy Cajun Honey Butter Shrimp are made in one skillet and ready in 20 minutes or less! 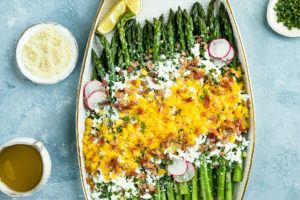 It's an incredibly easy, yet flavorful meal that the whole family will love! Make the sauce/marinade: In a small bowl whisk together: garlic, lemon juice, zest, Worcestershire, honey, salt and pepper. Set aside. Marinate: Place the shrimp in a large bowl and add Cajun seasoning. Toss to coat. Add in HALF of the sauce, reserving the other half (reserve about 3 TBS) of the mixture for later. Stir shrimp to coat. Transfer shrimp to the refrigerator to let marinate for 30 minutes. Cook: Melt 2 tablespoons of the butter in a large skillet over medium-high heat. Add the shrimp to the skillet, discarding the marinade. Season shrimp with salt and pepper. Cook, stirring frequently to ensure even cooking, for 2-3 minutes or until shrimp are just starting to turn pink. Pour in the reserved honey mixture and remaining butter. Cook, stirring frequently, until the shrimp are cooked and the butter coats the shrimp, about 2-3 additional minutes. Remove shrimp from skillet with a slotted spoon and transfer to a serving bowl. Increase heat to high and cook sauce, stirring frequently, until thickened, about 2-3 minutes. Taste sauce and adjust for seasoning with lemon juice, salt and pepper. Pour sauce over shrimp in serving bowl. 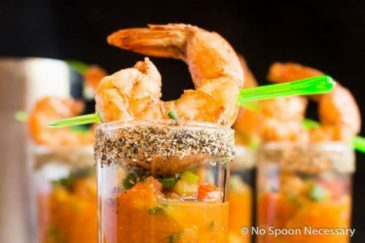 To serve: Sprinkle shrimp with parsley and garnish with optional lemon wedges and green onions if using. Enjoy! You can use any size shrimp you would like, just be sure to adjust the cook time up or down accordingly. You can purchase Cajun spice mix at the store, or you can make your own. I highly suggest you make your own so you can control what is in the spice blend and adjust it to your own tastes. Besides, you probably already have all the seasonings needed in your pantry, and making your own is cheaper than buying a prepared one. I just stumbled across your blog as I was searching for a “grown up mac & cheese” recipe for tomorrow nite… because when you are old-ish and married a long time, this is how you spend your Friday nights: drinking wine while the dogs watch you on the computer planning dinner for Saturday night. 🙂 I really wouldn’t have it any other way. Anyway, the post was from several years ago and I just felt compelled to investigate whether you were still doing the blog and was so happy to see you are. Definitely following from now on. You are clever and passionate and have just the right amount of narrative vs. pictures. Can’t wait to explore past recipes! Thank you so very much for your warm, kind comment! Honestly, your Friday nights sound a lot like mine!! And, just like you, I wouldn’t trade them for anything. 😉 If you ever have any questions on a recipe, please let me know! I’m always here to help! Cheers!! Amen! I’ve been busy whipping up pumpkin this and pumpkin that lately! 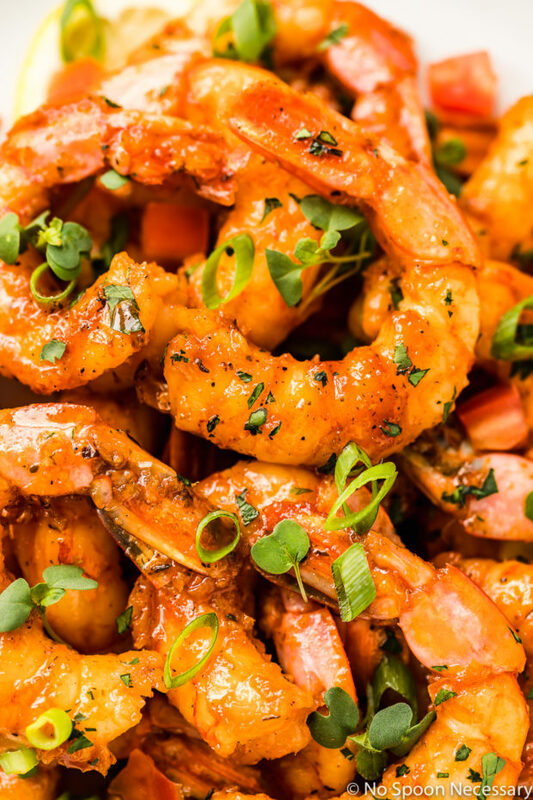 You know our love for shrimp, so these will be happening soon here! 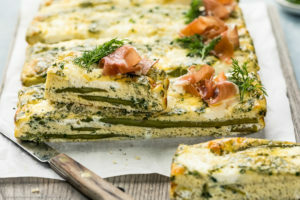 Perfect for a little appy or dinner! We’ll go for either!! Happy weekend love! AMEN, sister! 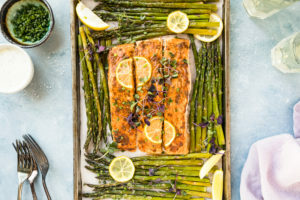 All my energy goes into making fancy dishes for holidays this time of year; weeknight dinners need to be easy! On that note–does the honey butter sauce count as dinner? Because I don’t even need anything to put that on, just give me a straw. You truly are the queen of sauces! Have a great weekend, Chey! This looks amaaaaazing! And I love the ease of preparation and how flavourful and delicious they turned out.